The flu and RSV seasons are officially upon us! With every state reporting flu outbreaks there is a fair chance that you and your family will face exposure this season. So how do you keep your family safe? Particularly if you have a very young baby to worry about? The struggle is real for parents, and those with infants have the added fear of RSV (Respiratory Syncytial Virus) to worry about. RSV in babies is particularly dangerous. Every mom to a young child has heard the RSV horror stories -children, sick in the hospital for days at a time, struggling to breathe. RSV in babies is basically every parent’s worst nightmare. And, while it is not something that only impacts babies, it does seem to have the most severe impact on our youngest family members and their fragile respiratory systems. Fortunately, there are some prevention techniques that truly can help keep your infant safe. Seriously, we can not stress the importance of this enough. Hand hygiene is the single most effective way to prevent the spread of illness among people. If you do nothing else, make sure you wash your hands well and often. It’s hard, for sure, but if your BFF has a school age child that she brings to visit you and your newborn when you come home from the hospital, be serious about hand washing and handling of your baby. There is a reason hospitals don’t let unrelated children visit the maternity wards, and limiting the spread illness is one of them. But this caution goes beyond kids -it applies to adults too. If a visitor appears sick, is coughing or sneezing, or simply doesn’t wash their hands before going in for a baby hug, make them pump the breaks. Anyone who loves you and your infant won’t be offended if you ask them to wash their hands before handling the baby, and anyone who is sick should stay home until they are well. Traveling and going out in crowds with your newborn is a risk, particularly at this time of year. If you have to travel, be sure you wash or sanitize your hands frequently and always before handlining your baby. Also, keep your child covered in his carrier whenever possible so that sick people aren’t sneezing and coughing on him. There is no vaccine for RSV, but there is an annual flu vaccine that can help protect your child. Your newborn may be too young to get a flu vaccine himself, but as a precaution, you can get vaccinated to protect yourself. Doing so will also protect your child because it will help you not bring the flu virus into your home. 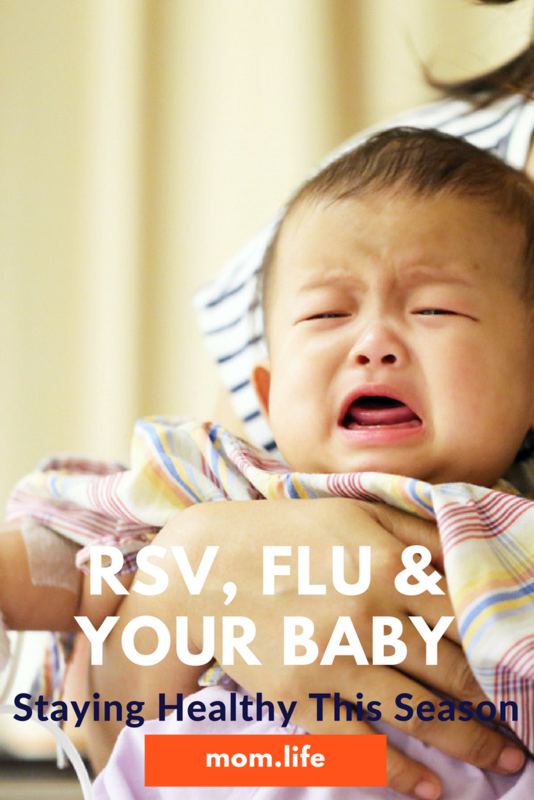 Know the symptoms of RSV and RSV related illnesses so you can catch them early. Early symptoms are similar to a cold -runny nose, cough, possibly a fever. After a couple of days, your child’s cough will get worse, and breathing will become more labored and difficult. You may hear wheezing. It is imperative that you contact your doctor for treatment. Stuck at home with a sick baby? Get answers and support from moms in our app! Download the mom.life app today!